Finally an underwater flash range that delivers the performance you've come to expect from professional studio lighting topside. 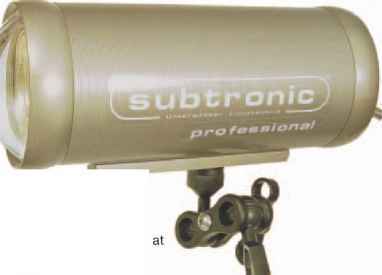 Packed with features to compliment the most creative photographer, Subtronics also boast user friendly features for the beginner. These high power, wide angle strobes offer tough aluminium construction, ultrafast recycling of 2 to 2.5 seconds, 7/10 watt switchable modelling lights, Nikon dedicated TTL automation, 7 manual powers, slave, test and SOS, smart chargers with 2 hour recharge and optional laser aiming and colour temperature adjustment. We'd ask you to compare. But there's nothing to compare to. And with prices starting just £749.00, that includes the price.